Be the first to share your favorite memory, photo or story of Byrdie. This memorial page is dedicated for family, friends and future generations to celebrate the life of their loved one. Byrdie Imlay, age 98, of Jewell, IA, passed away on Wednesday, October 24, 2018 at Mary Greeley Medical Center in Ames, IA. Byrdie Josephine (Berg) Imlay was born on June 11, 1920 on a farm outside of Ellsworth, Iowa. She was third of ten children born to Olaf S. and Sadie Caroline (Oxenfield) Berg. 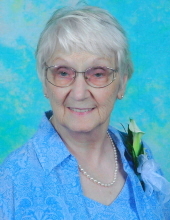 Her family moved into town where she attended Ellsworth Community School and graduated in May of 1937. She spent some time in Des Moines working as housekeeper for a wealthy family. On April 13, 1940 Bea was united in marriage to Robert Elmer Imlay in Osceola, Iowa. They lived in Jewell for a time before moving to California where Bob worked for Douglas Aircraft. They came back to Jewell and Bea was the bookkeeper for the various enterprises Bob took on. Bea also worked at the Jewell Distributing and was her son Ron’s bookkeeper until she turned 90 years old. Bea and her husband were avid roller skaters. She was a very good bowler actually bowling into her 90’s and being inducted into the Ames Area Hall of Fame. She also enjoyed reading. She was a member of Ames Area WIBC (Women’s International Bowling Congress) and Jewell United Church of Christ where she was active in the Women’s Auxiliary. Bea is survived by her daughter Judith Ann Tichenor of Bowling Green, Kentucky; son Ronald Imlay of Jewell, Iowa; three grandchildren Michael Day of Adel, Iowa, Adam Day of Beaver Dam, Kentucky and Dealynn Day of Colorado Springs, Colorado; one great-grandson Nicholas Day of Tucson, Arizona; two sisters Ruth Hitsman of Boone, Iowa and Ruby Grover of Houston, Texas; along with many other relatives and friends. She was preceded in death by her parents, husband Robert, three children Jerry, John and Susan, seven brothers and sisters Sylvan Berg, Stella Busby, Omer Berg, Inger Scurek, Viola Echelberger, Virginia Krull and Betty Berg. To send flowers or a remembrance gift to the family of Byrdie J. Imlay, please visit our Tribute Store. "Email Address" would like to share the life celebration of Byrdie J. Imlay. Click on the "link" to go to share a favorite memory or leave a condolence message for the family.